Usually this is a park run enjoyed by the family but I am grateful that today we shall be enjoying a nice leisurely stroll around the estates beautiful grounds. 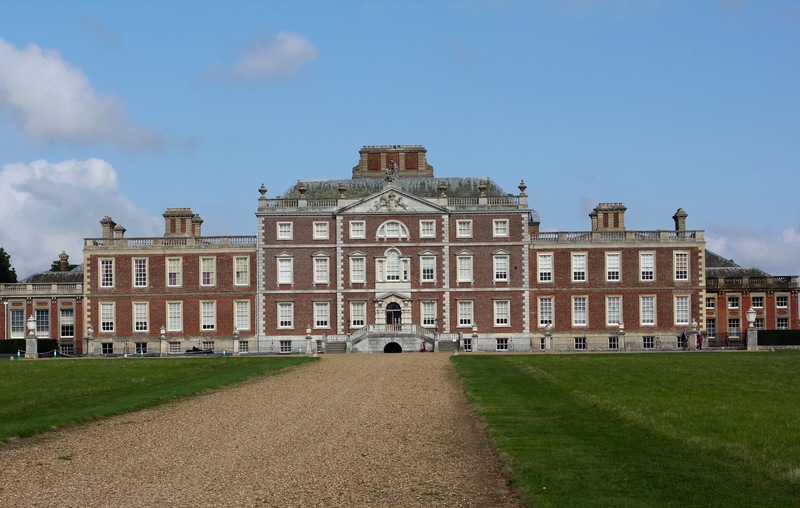 I’m feeling a little ‘Pride and Prejudice’ walking around and the historical journey of the grand Wimpole Hall has endured is not short of interesting, intriguing tales that could rival the Jane Austin novel. Love matches not approved, financial problems, political motivations, problems with heirs or lack thereof and more. Recently a shoe was found under some floorboards apparently to keep witches at bay. Rudyard Kiplings daughter, Elsie, was the last owner-occupier, who also restored the property, then graciously left the estate to the National Trust upon her death. Today we walk around the estate and enjoy the stunning views of lakes and even spot a pike or two in the tranquil waters. An interesting project to celebrate landscape designer Capability Brown by placing easels in particularly picturesque locations. The idea is that you can paint the view behind you by looking up into a mirror that gives an artists perspective. Then there is the extroidinary folly in the form of a ruined castle – as it turns out a nice place to enjoy some lunch. As we continue through woodlands, rolling hills and open fields we also have the added bonus of a bounty of blackberries – very nice. The building of ‘ruins’ on an estate added a certain amount of prestige and this particular one has even been restored. Rare breeds of all kinds are being bred here and you can even eat them – if you are that way inclined. Our foraging continues at the the farm shop and we end up with a couple of books and some rare breed pork sausages. A wonderful day shared with a wonderful family. This entry was posted in Travelling on September 25, 2016 by peakesj6. In Cambridge we check out the Scott Polar Research Institute and find it a very informatively interesting museum. The tragic ending to this expedition is brought to life with exerts from diaries and it seems to me that knowing they all faced certain death they did so with dignity and courage. Amundsen does also get a mention as being the first to arrive at the South Pole but there is no doubt of the strong loyalty to Scott and his intrepid fellow explorers. There are many artefacts and stories of how the indigenous people lived, survived and developed a unique culture in the remotest areas of the Northern Polar Regions. An amazing glimpse into the past. Off to the markets for some cheese tasting, cheese buying and some lovely bread before getting on the Cambridge Park and Drive bus to spend the evening catching up with family. Time to meet up with some more cousins some of whom I’ve never met and one who I had caught up with when she was 10. Her partner is a farmer so we learn all about sugar beets, potatoes and other lucrative produce for market gardeners – Shane is very interested to find out the wheat yields which are a great deal higher per acre than Australia. Kings Lynn is a interesting little place and the ferry ride across to West Lynn is quite a treat especially with a captain who has a rough, broad northern accent so of course I have to keep asking him questions just to hear him talk. He has quite a bit to say when on our return journey the tide was out so he has to get out and push us to the jetty – now I know why he was wearing the full overall waders. We top the visit off with a night out catching up on all the gossip of our family tree – great stories, some sad and some crazy but all very interesting. This entry was posted in Uncategorized on September 23, 2016 by peakesj6. 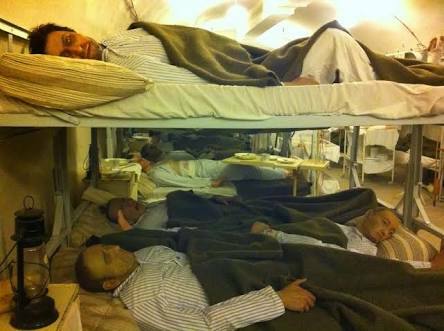 The Secret Hospital in the Rock. 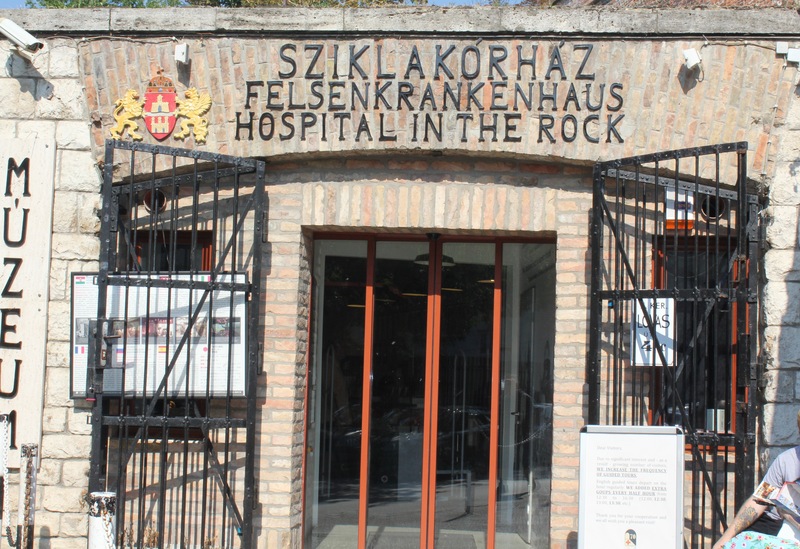 Without the obvious signs the hospital/bunker could, even today, be kept a secret and, in the past, meticulous measures were taken to keep the complex medical facility hidden under the Buda Castle Hill. 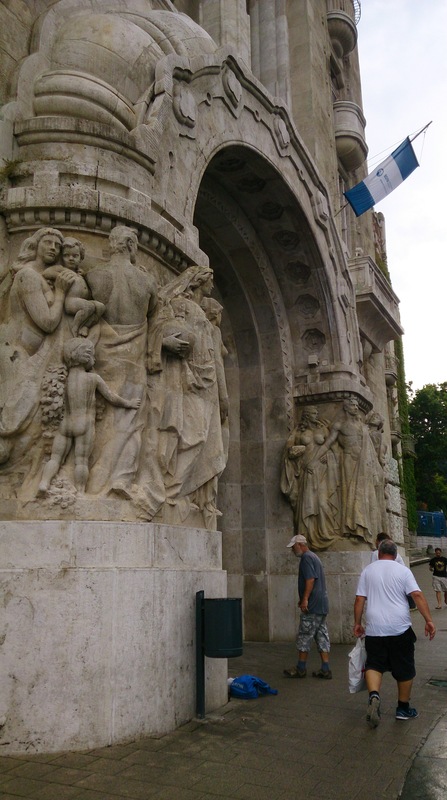 Built during WWII, a 6 mile stretch of interconnected caves and tunnels came into its own when Budapest was under siege in 1945 and then during the 1956 Revolution to treat wounded civilians and soldiers. Between 1958 and 1962 it was expanded to withstand chemical and nuclear attacks. Originally only meant for 60 patients at the worst of the bombing and fighting held up to 690 patients with only 30 medical staff in attendance. This museum is very well done, sometimes gruesome but stories of heroics, kindness, commitment and extreme conditions will stay with me for a very long time. This will be a rather long entry as I don’t want to leave out a thing and it starts with the boys heading off to do their own thing leaving me to my own devices. I am responsible just for me and it is strangely liberating. I catch a tram then wait quite a while for the bus that will take me to the caves. Unfortunately the bus driver knows no English and only points up the hill so I am not overly confident but reasonably sure I am on the right bus and then we just sit in the bus for another 10 minutes before we are finally on the way – not to worry I’m sure I have plenty of time. When I get off there is no big cave sign or anything but there is a car parked with a man inside like he is waiting – maybe they pick you up I’m thinking but he doesn’t know any English. I walk a little way up the road and decide I must be too far up so I turn around and there is now another man standing near the car – came out of nowhere I swear. I walk closer and he says where are you going? – perfect English so I explain and he tells me to head back down the hill. I start to jog as it is after 3pm by now and I have to be there by 3:30pm. I come across another side street with strange signs and a jogger asks if I’m ok and after explaining he tells me I am heading in the right direction so off I go with him speeding past. Rather puffed by now I still keep jogging when a police car pulls up beside me and says jump in I’ll take you – it is the man that appeared from nowhere so I hop in and he speeds very quickly around the last few bends. I thank him profusely and then he turns a wags his finger at me telling me not to get in cars with strangers. It leaves me wondering what was going on up there at the bus stop – some sort of ‘sting’ and did I get in the way? – ok maybe not but it was a little out of the ordinary. I run to the caves and luckily for me there are 3 groups getting ready to go – I haven’t missed out after all – not sure to be elated or disappointed. We reach a rock with a steel door and as we enter the door is slammed shut echoing around the small cave entrance – no going back now. The next 3 hours are spent climbing down a 10 foot ladder, crawling through small spaces, twisting and turning while using your arms to squeeze yourself through tunnels, sliding on your bum down narrow shafts, climbing up walls with slippery footholds, using you back and legs to shimmey up a sheer walls and listening to stories and facts on caving – sometimes it is hard to tell fact from fiction but it is all exhilarating. ‘The team’ help and encourage each other all the way, joking around and often putting out a helping hand to pull you up over a difficult hurdle. Our guide is strong and at times some of us have to stand on his leg to reach the next level of footholds. At one stage I got a cramp and he just gave a mighty heave and I was up before I knew it. The end cavern is like a natural stage and our guide sings a beautiful song in Hungarian followed by us singing together Frere Jacques – the acoustics are amazing. We entered in daylight and come out in darkness all in a state of euphoria. We are nothing short of ecstatic. What a great group of people. They even get me back to the street I am staying and we enjoy a beer together at the Ruin Bar reliving our extreme adventure. Unusual formations caused by the hot springs. This entry was posted in Travelling on September 16, 2016 by peakesj6. This morning we enjoyed a lovely walk around Pest, well actually we got lost so instead of looking at the dead hand of the first King of Hungary at the St Stephen’s Basilica, named after him, we find cosy little courtyards, lots of old buildings that looked very important and great little beer gardens. The weather is hot and sunny so walking between the shade of the tall buildings is very pleasant and the good news is we did eventually find our way back. The markets are our next stop to pick up some bits and pieces for a nice home cooked dinner tonight – no getting lost now we have our guide back with us. The front of the markets with the hand painted tiled roof – where you can buy all kinds of food, clothes, knicknacks and lunch! 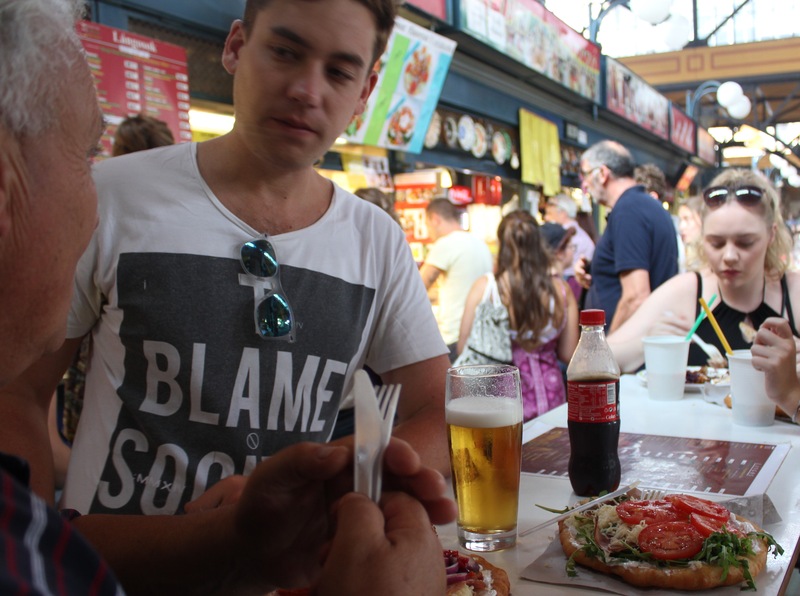 Langos – traditional Hungarian food usually served with sour cream and grated cheese – we just added a couple extras – mmmmm! The weather changed rather abruptly with a sudden torrential downpour which seemed to last quite some time with us hiding out in a shoe shop. Thankfully it doesn’t stop us from getting to the baths, of which there are many to choose from although mainly in the Buda part. 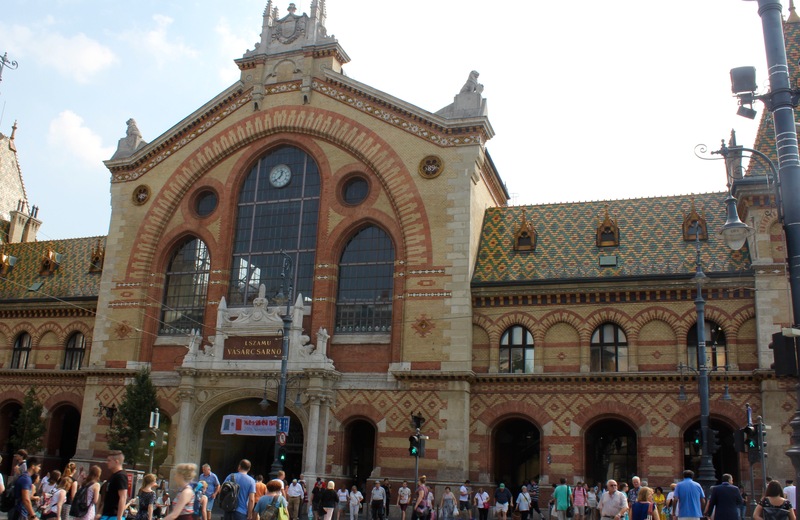 The St Gellert Thermal Bath is wonderfully, luxurious and has different pools to try with various heat or cool temperatures with a sauna close to a cold plunge pool – invigorating! This entry was posted in Travelling on September 15, 2016 by peakesj6. Budapest just conjures up mystic, spies and James Bond movies in my mind at least. To be honest I’m not disappointed it is a city of troubled, tragic overwhelming history. One of the very first things you learn is that it is made up of Buda and Pest (pronounced Pesth)- a bit like Albury and Wondonga separated by a river and in this case the Danube and of course we don’t call it Alburydonga but maybe we should (ha ha). 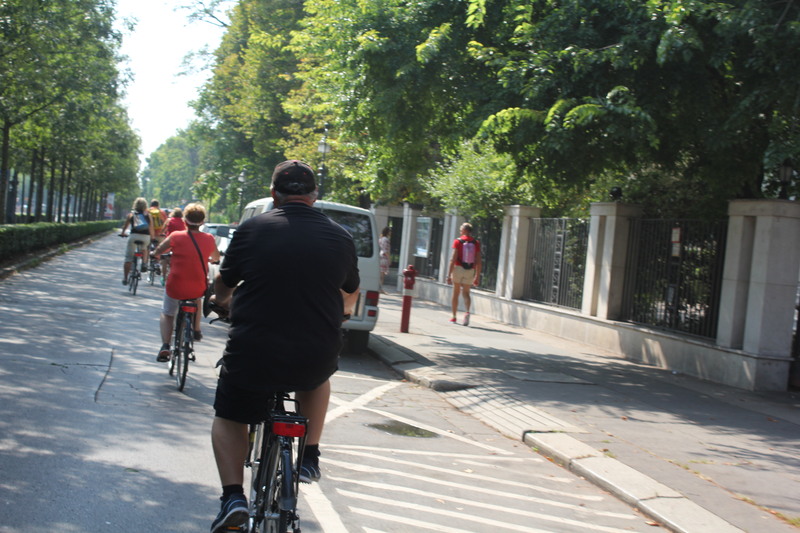 A biking tour around the city is highly recommended, by Daniel who has been on it 3 times, and it is truly a fantastic way to see and hear the history and highlights, of which there are so many. There are many mysteries to the city, a castle where no royalty or significant historical figures ever lived, a lake that isn’t a lake, a swimming pool that is a restaurant and many buildings looking like they are much older but are replicas of previously destroyed buildings. It truly is facinating! 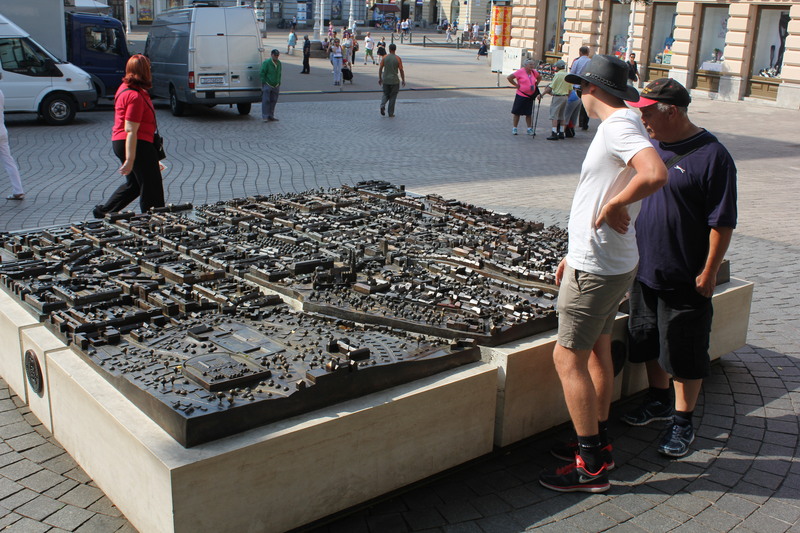 There are stories of witches, heroes, Royal triests, battles won and lost, building projects that make your mind boggle with the diversity, poets and muciscians all told with passion by our local guide, Anna. Now I am highly recommending it – even the meeting instructions are enticing – see the person with the bike on the steps of the Basilica. The Chain Bridge According to the story, the sculptor, Marschalko János forgot to carve out the lions’ tongues. A boy made a remark about it at the opening ceremony. The sculptor became so distressed that he jumped off the bridge. Matthias Church- rebuilt around 30 times and even once a Mosque. The tiles on the roof of Matthias Church are all hand painted. The bike ride/tour takes us about 5 hour so now I’m hungry – yes I know and I’m in Hungary so it’s off to a place close to our b n b for a good feed and definitely a few cold beers. This entry was posted in Travelling on September 13, 2016 by peakesj6. Leaving a lovely accommodation behind and saying farewell to Jasmine we head into the main town of Zagreb to view tallest building which happens to be a church. Cathedral of the Assumption of the Blessed Virgin Mary is spectacular and with its intricate carvings of statues and decorative features it is a wonder to behold. Being a Sunday beautiful organ music filters out into the square and adds a kind of spirituality to the atmosphere. 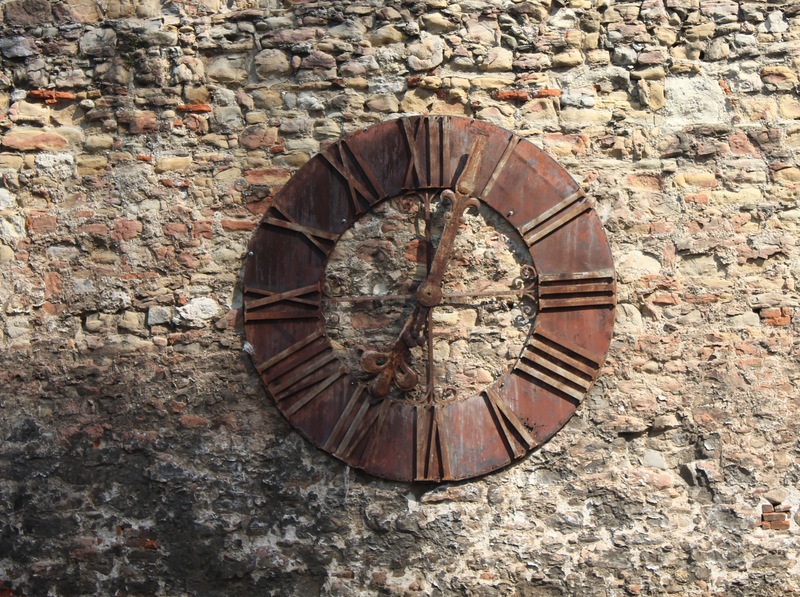 The church was originally built in 1217 then destroyed by the Mongols in 1242, rebuilt in 1287, fortified only to be severely damaged by an earthquake in 1880 and the cathedral “clock stopped! never to go again” – it is now mounted on the wall as a permanent reminder. We are treated to some delightful traditional dances and we find some lovely fresh fruit at some nearby markets. Lunch in the park with a couple of beers and we are ready for our 5 hour bus trip to Budapest.